Swimming. I do love that sport and I can actually participate because it doesn't involve running. Actually, I do. 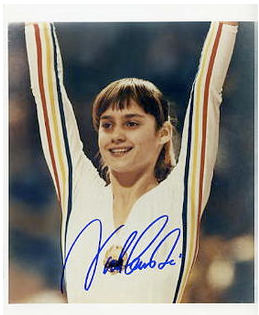 Nadia Comaneci in 1976. I very much wanted to be a gymnast as I am sure every little girl did at that point. She was just amazingly spectacular to watch. It was mesmerizing. And yes. You must be a woman of a certain age to understand. For the rest of you, google it. Nope. I have people and that is all I know. They spoiled me rotten and loved me to death, so who really cares? Um. Well. Yes. But it's not so much sleeping late as much as not getting around. I love to sit, drink coffee and read the newspaper. I can wear my pajamas for a long time. My friends have seen me in my robe on several occasions. 7. Have you ever performed CPR on anyone? Do you know how? Nope and yep. I hope I never have to use it. Greece. I think it seems like a very romantic place. I keep pointing out cute boys to College Girl. Does that count? Of course, if her face freezes like that, then she won't ever get a husband. The Help and I highly recommend it. 11. Do you enjoy sleeping late? NO, YOU write the question! 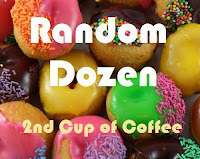 How's that for random?? Ok, Lid. You asked for it. Here's my question......How do you feel about underwear? I hate underwear. They're just stupid. Cheeseburger and fries. Just sayin'. Hmmmm...so now you have me wondering if you wear underwear. ?? "The Help" is on my book radar. Everyone has really liked it! I didn't need to google Nadia. Sigh. So glad to hear someone else wears their jammies for a long time. I think all my neighbors have seen my robe. It's a gift. I love a good restaurant cheeseburger! I've got the Help on hold at the library. Hopefully I can get to it when it comes. I'm a tad overcommitted on book reviews. OH man, I love fries! :) I'm kinda bossy too, I bet my brother would have picked that for me! Love the face. :) Ack! I don't need to Google Nadia! Sigh. #11 - you and Meredith Viera. I personally can't imagine not having it!